A subtle but trenchant exploration of issues of friendship, secrets, pirate's booty, and the ways each of us is an attacking pirate in our own way. Heart-rending, but, figuratively, unlike getting a pirate saber through your chest, which would be the literal way, so, much better. Pirate attack! Pirate Attack! 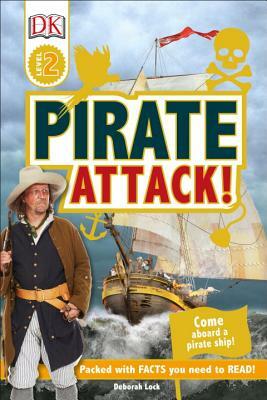 will build reading skills while teaching exciting vocabulary and entertaining young readers as they experience attacking another pirate ship, winning the treasure, and overcoming a storm at sea. Explore the parts of a pirate ship, pirate rules and how those who broke them were punished, pirate food, and even learn a pirate sea shanty. Perfect for 5- to 7-year-olds beginning to read fluently with support, Level 2 titles contain carefully selected photographic images to complement the text, providing strong visual clues to build vocabulary and confidence. Additional information spreads are full of extra fun facts, developing the topics through a range of nonfiction presentation styles such as diagrams and activities. Series Overview: Trusted by parents, teachers, and librarians, and loved by kids, DK's leveled reading series is now revised and updated. With shiny new jackets and brand-new nonfiction narrative content on the topics kids love, each book is written and reviewed by literacy experts and contains a glossary and index, making them the perfect choice for helping develop strong reading habits for kids ages 3–11. Deborah Lock is a senior editor at Dorling Kindersley as well as a writer and mother of two. She was previously a teacher and has worked at Dorling Kindersley since 1998, producing children’s nonfiction books about all kinds of topics, from history, science, and politics to art, music, gardening, pirates, and mythical beasts. She is the series editor of the DK Readers reading program and is currently working on some innovative new products for the bestselling educational Made Easy workbooks program. She spends her leisure time involved with youth work and has a passion for singing, drama, and dancing.